I didn't go last year because it was too close to my due date, and the original plan when I started Joie Studio was to EXHIBIT at the National Stationery Show in 2010, but Baby Joie has changed the plans and now I feel lucky enough just to be able to go and see the wonderful goodness going on in the world of stationery. It's going to be a quick trip since Baby Joie's not going with me (I think he would be *not* pleased at a trade show) and the husband has to work, but I'm going to go this year for a day to see what my letterpress friends are up to and see what yumminess is available from paper vendors from all over. Yes, I fly into New York Saturday night, visit the National Stationery Show on Sunday, and then fly home on Monday morning. But I'm excited because I haven't been back to New York since the last time I went to NSS in 2008, and I'm looking forward to saying hi to one of my favorite cities. Oh, design bloggers, why do you do this to me? I covet! Oh, do I covet! Besides the fact that I will probably drop some amount of cash on some wood signs that I don't really need, I am in love with the color composition in the picture above. The blue on the grey is simply gorgeous. It's springtime here, and right outside my print studio are gorgeous colors and scents as the garden starts to wake up. I am in love with spring (and with the new lens on my DSLR)! Enjoy! You want me to do what??!!! Multi-panel letterpress invitations. That whale of an invitation is 5.5" x 17" of letterpress goodness that folds up to 4.25" x 5.5" (a convenient fit into an A2 envelope, and, can you believe this -- only one postage stamp!). This is what happens when two designers decide to get married, I'm sure. Every time I see something from two professional designers getting married it's something inspiring, beautiful, and full of hidden difficulties in letterpress. (I need to dig out the other invitation that I did for two designers and show you the letterpress gorgeousness there!) But because I love James and everything that he designs, I didn't protest at all, except to ask him a couple times if he was sure he wanted something this long. Secretly, though, I have wanted to do something like this for a long long time. But as I said before, left on my own, I don't tend to leave my comfort zone. But I got this gorgeous design and some digital proofs (I had told James that I needed a digital proof and I don't have anything that prints 17 freekin' inches long! ), and how could I say no? Ingrid and James chose a gorgeous blue color which I hand mixed the ink to match his Fiery printout. I still can't believe that I matched PMS to a digital printout. Yes, I am still in awe that James' digital printout was a spot-on match to the PMS specification. I was hoping that these invitations were up to snuff and got really nervous about the letterpress invitations because these two designers have quite the keen eye! I was so nervous I even showed Shino at Fugu Fugu to make sure they looked okay before sending them. Luckily for me, they were completely in love with the result! 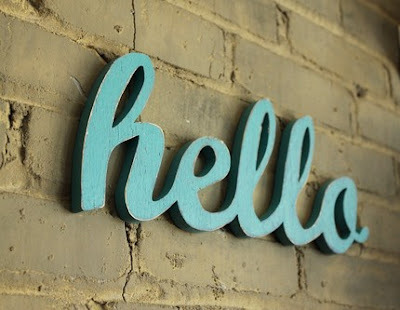 I'm wondering how many of you have blogs, and if you do, how do you deal with anonymous comments? Joie Studio's blog comments are moderated so it's not such a huge deal, but I'm finding more and more that "Anonymous" is synonymous with "Spam." I know it's easier to post as "Anonymous," so I haven't restricted anonymous comments yet, but all the same, it's kind of annoying for me to go through and reject comments about diet pills and some more...uhm...interesting remedies. If some of my anonymous commenters who actually have an interest in Joie Studio's blog can chime in here -- I'd love to keep the option open if you find it useful. Let me know! 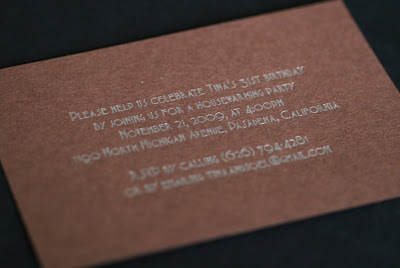 My latest craze is letterpress printing invitations with metallic inks on dark paper. I especially the look of the metallic ink on dark brown -- there is something just so rich looking and luxurious about it. Added to that, the metallic ink is a vegetable oil based ink -- totally eco-friendly! The top pic is a housewarming invitation done with metallic pewter on some leftover brown paper I found laying around the studio. 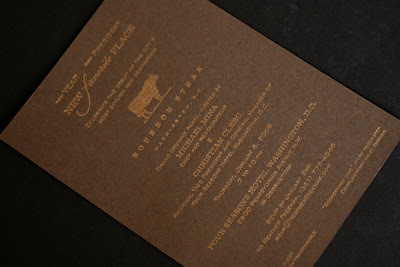 The bottom is a restaurant opening invitation we did for Bourbon Steak in Washington, DC, on 30% PCW chocolate brown paper -- double eco-friendly and totally chic! The kicker is that since it's only one color, metallic on dark paper is on the whole CHEAPER than a two-color letterpress project because there's only one color. No fooling!